No matter the activity, it always helps to have goals; CrossFit, or fitness in general, is no different. 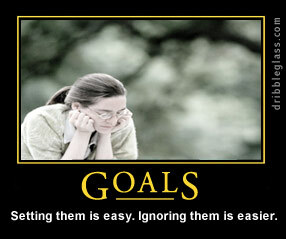 Setting the goals can be almost as difficult as achieving them sometimes. The key is to be realistic, sure you might have an end goal to complete a marathon but you can't have that goal to be finish a marathon next month if you haven't done a 5k since high school. In today's rapid rewards society we all expect to get what we want instantly and sometimes forget the amount of work that must be done. Write your goals down! Having them on paper make them much more "real"
Try to stay consistent. A good pace always helps things. If you try to do something every day from the very start then you'll likely get burnt out, or worse you'll over train and hurt yourself. Find people who have achieved the same goals that you want to achieve and ask questions. At least in the CrossFit community they will be happy to help you. Here are some links that might help you set your own goals then I'll get into my personal goals. What do you all think about these goals...attainable? Are they too lax? What are your goals? Maybe I can play copy cat. Today I have a softball game so I miss out on my CrossFit training. I decided to NOT take tomorrow as a rest day and I will do a WOD (prolly the FRAN) and find my max rep of the clean.